In an effort to allow Albright to better engage with alumni and donors and focus on relationships, the office formerly known as Alumni Relations was restructured in January 2018. 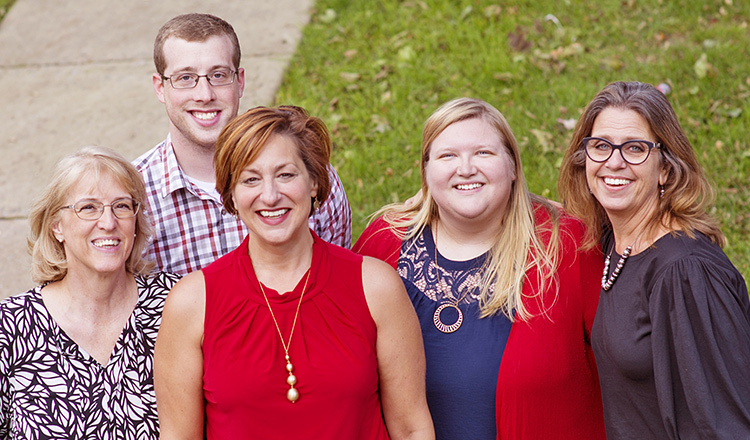 Please meet the members of the new Alumni & Donor Engagement team! Ralia C. Vardaxis ’87 was named assistant vice president for alumni and donor engagement in January 2018. Vardaxis had served as a leadership gifts officer at Albright College since 2011 and was integral to the success of the That Their Light May Shine campaign, which raised over $58 million for the college. She has excelled at creating long-lasting relationships, engaging alumni and donors, raising funds and has shown leadership in bringing group fundraising projects to fruition. In her new role, Vardaxis oversees alumni and donor engagement and works collaboratively with the Alumni Association Board of Directors and leads alumni relations events, communications and volunteer opportunities. Recognizing the important relationship between engagement and individual philanthropy, Vardaxis also provides leadership and oversight of The Fund for Albright, the College’s annual fund. Stephen K. Thomas ’14 was named director of advancement events and communications in July. Thomas is an Albright alumnus who studied business administration with a concentration in marketing and management. He was a member of the Alpha Sigma Phi fraternity, captain of the Albright swim team, an admission ambassador and the Albright lion mascot! In his role at Albright, Thomas is responsible for executing events related to alumni outreach and donor engagement as well as the social media, communications and writing components necessary to promote and engage our alumni base. Kathleen A. Sutton has been at Albright since October 2011 and was recently named senior director of The Fund for Albright. Sutton studied digital media and communications through Albright’s Accelerated Degree Program and currently manages all aspects of Albright’s direct mail solicitations, social media giving campaigns, online giving, recurring giving and email solicitations. Sutton has been working in fundraising for more than 22 years. Amanda Walck ’14 has been the assistant director of The Fund for Albright since September 2014. Walck is an Albright alumna who studied history and sociology, with a focus on criminology. As a student, she was a member of Sigma Kappa sorority, an executive member of the Panhellenic Council, SGA representative for the Class of 2014 and worked as an archives assistant in the library. In her role at Albright, Walck is responsible for education on philanthropy, through such programs as the Senior Class Gift and the Lion Diplomats, as well as stewardship and solicitation of donors through the phonathon program and outreach to her fellow young alumni. Dawn Gieringer ’10 joined the Albright College team as Coordinator of Alumni and Donor Engagement, in October. A Jacob Albright Scholar, Dawn studied English at the college and was named a member of the international English honor society, Sigma Tau Delta. Having completed three ACRE projects as an undergraduate, Dawn considers the experiences among the most rewarding and unique opportunities Albright offers students and faculty. After Albright, Dawn earned a master’s degree in English at Villanova University and taught English courses as an adjunct instructor at Albright. In her new position as coordinator, she will support the entire staff of alumni and donor engagement, lending clerical support and coordinating special projects.